The Linden Tree Coffeehouse 34th concert series continues on Saturday, Feb. 9th featuring Kerri Powers and Quentin Callewaert, two New England favorite singer-songwriters. Both performers were presented in semi-formal showcases at the 2018 Northeast Regional Folk Alliance conference. Kerri Powers has just released what some are calling the “essential cosmic American album.” Starseeds has been receiving critical acclaim and extensive airplay throughout. With zero radio or publicity assistance, her self-titled EP in 2014 was able to land the #1 spot on the Roots Music Report’s Top 50 Folk Albums of 2014. Over the years Kerri has appeared at numerous prestigious venues and musical gatherings including the Boston Folk Festival, The Philadelphia Folk Festival, and Telluride Bluegrass Festival. She has toured throughout the United States and overseas to The Netherlands, Belgium, and the UK. Her song, “Diamond Day” was featured in the movie CHUCK and other tracks have made their way into TV series such as Rescue Me and Justified. Linden Tree Coffeehouse is very happy to have one of our long-time favorite performers back this year. 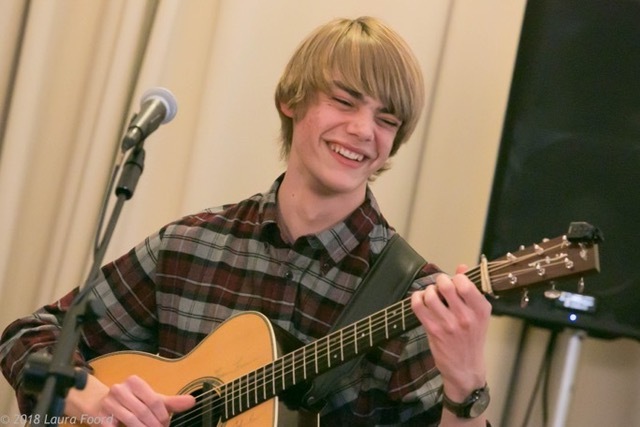 Eighteen-year-old Quentin Callewaert has only been on the music scene for a few years but has created a major buzz as one of the most gifted guitarists around. At last year’s Linden Treed Coffeehouse’s Winter Potpourri, Quentin was our top winner. Classically trained, his interest in fingerstyle –acoustic guitar was inspired by Doc Watson, Merle Travis and Tommy Emmanuel. He is also a gifted singer with a refreshingly bluesy voice that compliments his blend of Americana, gospel, and bluegrass. 2018 was a very busy year for him, performing full shows in venues all across the northeast.